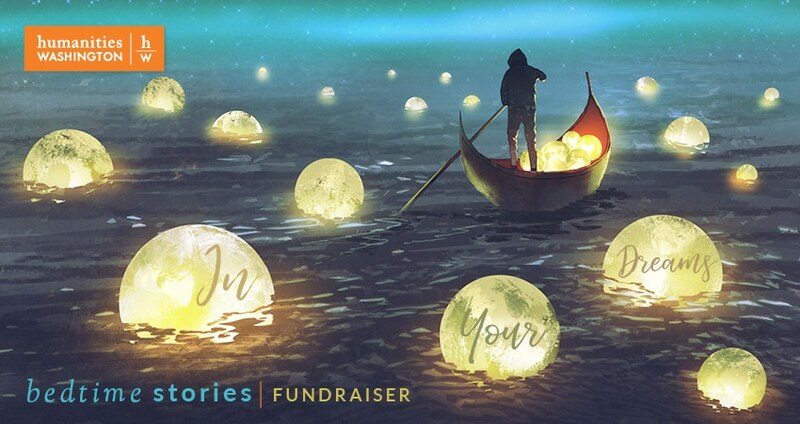 Friday, October 26, 2018 at 5:30 p.m.
Bedtime Stories Spokane is our annual fundraiser in support of Humanities Washington’s work. The event raises critical funds to create “public squares” across the state—places where communities come together to explore ideas and new perspectives. At Bedtime Stories, Northwest writers unveil original short stories created just for the event. Join us for readings by Northwest authors Matthew Sullivan, Maya Jewell Zeller, and Washington State Poet Laureate Claudia Castro Luna based on this year’s theme, “In Your Dreams.” The evening will also feature the presentation of the Humanities Washington Award to Dr. Sam and Rosemary Selinger for their significant contributions to the Spokane community. Matthew Sullivan is the author of Midnight at the Bright Ideas Bookstore, which was an IndieNext pick and IndieBound best-seller, a Barnes & Noble Discover pick, a Goodreads Choice Award finalist, and is currently on the shortlist for the Colorado Book Award (General Fiction). His stories have been awarded the Robert Olen Butler Fiction Prize and the Florida Review Editor’s Prize, and his writing has appeared in The New York Times (Modern Love), Lit Hub, Joyland, The Masters Review, and many other places. He received his M.F.A. from the University of Idaho, and since 2003 he has been teaching writing, literature, and film at Big Bend Community College in Moses Lake. Claudia Castro Luna is the current Washington State Poet Laureate. Castro Luna fled war-torn El Salvador for the United States at the age of 14 with her family, and went on to earn an MFA in poetry and an MA in urban planning. After working as a K-12 teacher, she became Seattle’s first Civic Poet, a position appointed by the mayor. In that position, Castro Luna won acclaim for her Seattle Poetic Grid, an online interactive map showcasing poems about different locations around the city. The grid landed her an interview on PBS NewsHour. She is the author of the poetry chapbook This City and the collection Killing Marías, the latter of which is currently nominated for the Washington State Book Award. Maya Jewell Zeller is the author of Alchemy for Cells & Other Beasts (with visual artist Carrie DeBacker), the chapbook Yesterday, the Bees, and the poetry collection Rust Fish. Her essays and fiction appear in recent issues of Passages North and Booth Journal, as well as the anthology This is the Place: Women Writing About Home. Recipient of a Promise Award from the Sustainable Arts Foundation as well as a Residency in the H.J. Andrews Forest, Maya teaches for Central Washington University and lives in the Inland Northwest.